Today’s Featured Poem is Sonnets are full of love by Christina Rossetti, which appears in her collection A Pageant and Other Poems. Here at The Reader Organisation, we start every team meeting with a poem. Sometimes, one poem makes such an impact that it is passed from staff member to staff member and ends up being read at multiple team meetings, groups or events in the same week. At last count, this poem has popped up at least three times this week in Liverpool alone, and I’ve no doubt it’s made an appearance elsewhere around the country. If this poem strikes a chord with you, why not share it with your own colleagues, family or friends and enjoy some shared reading on a grand scale? Forwards, forwards o’er the starlit sea. Although we’re back to grey skies and rain again today, this week’s poem is a reminder that we’re getting closer and closer to those sunny summer months when the English countryside is at its glorious best and time seems to stand still. New rules by the justice secretary ban anyone sending books to prisoners. The Reader Organisation does not support this measure and urges you to sign this petition opposing restrictions on reading. I did not think I had the intellectual capacity to think outside my four cell walls. I wouldn’t have called myself a thinker but in prison you live inside your head. Everyone is a thinker in jail. I was literate, thankfully – so many people in prison are not. Joan Branton, the psychologist, lent me a number of books, among them Dostoevsky’s ‘Crime and Punishment’, a dark tale with huge resonance to me; it was depressing but at the same time also very compelling. And Joan started giving me the mental tools to try and figure out how I’d become what I’d become. Read the full interview with Erwin in Issue 53 of The Reader. We run shared reading groups in prisons across the UK each week, bringing men and women together to share great literature, connect with each other and improve wellbeing. Reading and shared reading groups provide opportunities for self-reflection, increase confidence, encourage greater social engagement, all of which contribute to reducing reoffending. 67% of those we read with feel more understanding towards each other and 61% feel more positive about life. Read the most recent research report into our work in prisons here. Reading opens doors, offers intellectual and emotional development and helps us to evaluate our place in society. It is vital that those in prison are given access to books and the opportunity to discover their potential through reading. The Reader Organisation’s Volunteer Reader Scheme, funded by the Big Lottery, is recruiting for volunteers in Liverpool and Wirral for our next training course. Our focus is to provide reading groups for older people living in care homes and sheltered accommodation throughout Merseyside. Our volunteers currently d eliver reading sessions to over 500 older people a week. 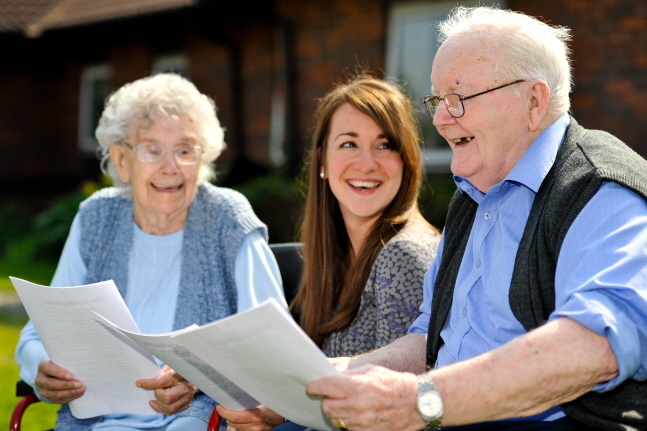 The reading sessions provide residents with the opportunity to engage with great literature and to share it together. Volunteers receive full training and support for the role and are usually paired together to deliver their reading sessions. Each course has a variety of trainees on it, from lifelong lovers of literature to complete beginners. The Volunteer Reader Scheme also gives opportunities to volunteers who are experiencing or are at risk of experiencing mental ill health, isolation or unemployment. We have the flexibility to respond to an individual’s personal circumstances and needs. Don’t worry if you feel a little nervous about getting involved. We understand this is a big step for you and we will support you all the way. The next training course is taking place on Tuesday mornings from April 29th to June 3rd. Attendance at all sessions is required. Books, like the minds from which they are born, are, by nature, unpredictable. They can shock us to the core, enlighten us or let us experience the whole range of emotions that we as humans are capable of feeling. Some very rare novels achieve of all these. For me, such a book is Cormac McCarthy’s ‘The Road’. ‘The Road’ is not entirely bleak and ominous. There is an underlying streak of love and the hope that even on the road to their inevitable demise, there will be a solution, an antidote to the protagonists and their troubles. At the very least they have each other. The father’s energy and fears are directed towards their search for food whilst the boy looks to his father, equally afraid, as a source of support, a foundation. Their exchanges are sparse and limited but there remains the paternal that survives beyond the pages of the novel. ‘We’re the good guys’, the boy reiterates, his mantra to survive. ‘Yes’, his father replies. 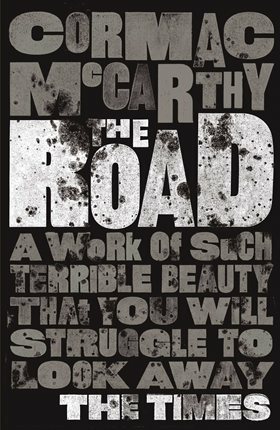 McCarthy has described how both are ‘each other’s world entire.’ In his dedication of ‘The Road’, McCarthy writes to John Francis McCarthy, his own son, and it is this raw and steadfast love within this relationship that lies at the very heart of the novel. McCarthy’s ability to transfix the reader on the two companions’ mundane life, his ability to grip the reader in a novel where the outcome is painfully real and set in motion merely proves his prowess as a writer. The words are as bare and as naked as the landscape which encapsulates the characters, as this encapsulates the reader. McCarthy’s prosaically beautiful lament lulls the reader into a security. At times the reality hits and its reverberations hit home. Such reverberations are the stark reality of death. McCarthy never simplifies nor does he elaborate upon its reality but confronts it with stark honesty. Indeed, within the novel, the finality of death is one of the few honest and startling truths in a world governed by fear and uncertainty of what is to come. For this reason, the man’s wife, the boy’s mother, kills herself. The father yearns for his wife and his memories of their time together as a married couple is heightened in joy and sensuality with its evocation of colour and music, as equally absent and missed: ‘He could remember everything of her save her scent. Seated in a theatre with her beside him leaning forward to listen to the music. Gold scrollwork and sconces and the tall columnar folds of the drapes at either side of the stage.’ Yet he remains stoical in the presence of his adoring son, retaining his composure to preserve the boy’s innocence. It is the gradual diminishing of this childhood innocence which is one of the most painfully real and heartbreaking aspects of ‘The Road.’ While the boy initially remains fixated upon himself and his father remaining the ‘good guys’, he soon becomes all too aware of death and the harsh brutality which others turn to in order to survive. This is preparation for his final act that requires tremendous courage and maturity: the realization of his father’s death. As his father lies dying, he vows to continue on his journey south and to retain the ‘fire’ within. Perhaps this is the real pilgrimage, the road of the title. While the actual journey is ultimately futile, the harsh and painful transition from a nervous and shy boy to strong-willed and independent young man is a triumph. The boy’s eventual acceptance of his father’s passing is marked with a simple burial before he continues on his way, accompanied again but with a strong sense of maturity and resolute. Another break from the routine of ‘The Road’, a routine that provides a steady and reliable foundation for father and son, is the appearance of the mysterious Ely. Elderly and impoverished, his proclamation that ‘There is no god and we are his prophets’ is open to reader interpretation. Whether these are the musings of a mad man or a startling truth from the lips of a prophet remains to be seen. Faith is a recurrent theme within the novel, for it is a faith of sorts that drives the boy and his father forward. The implications of the world as it is prompts and demands a questioning of god’s existence and Ely is determined that such an existence cannot be possible or permissible of the horrors that have besieged them all. Nietzsche wrote, ‘When you stare into the abyss the abyss stares back at you’ and this is certainly true. In confronting the very depths of despair and human fears, McCarthy’s novel explores the many facets and great depths of human emotions. While the novel is a prophetic call to take heed of the planet that we inhabit and regrettably abuse, it is also a celebration of human resolve, willpower and the love that binds us together, even more so in times of need. In many ways I admire the novel for what it is not: it is moving without being sentimental, honest and yet non-judgmental, ambitious and yet completely free of any pretension. This is writing, although simplistic in narrative, at its most daring and complex. The wife is neither heroic nor cowardly. Ely is neither foolish nor wise. Ultimately this is a novel of contradiction. It is a celebration of love in times of utter depravity. It is an intimate exploration of its characters yet always maintains a restrained distance. It is an elegiac and prosaically beautiful lament upon destruction and unimaginable horror. Yet most importantly it is an ageless parable of such startling and unsettling relevance for today. last week at a celebration at Calderstones Mansion House. The project developed out of Mayor Joe Anderson’s pledge to improve education standards and ensure that no child, if able, leaves primary school unable to read. The Reader Organistation are key partners in the project, and Founder and Director of The Reader Organisation, Jane Davis, has been appointed by Liverpool Learning Partnership to run the campaign alongside her current role. City of Readers aims to raise the profile of reading in the city and developing a new generation of readers. Children from Springwood Heath and St Christopher’s primary schools enjoyed stories and crafts at the launch event, alongside Cllr Lana Orr, Cabinet Member for Reading, and representatives from the project’s media partners, Liverpool Echo and Radio Mersesyside. Calderstones Mansion was buzzing with reading activity last Friday, as alongside the launch event we also welcomed PGCE students from our Hope Readers project at Liverpool Hope University were joined by children from local schools to enjoy some shared reading and get passionate about books. The importance of reading to a child’s development has never been so clear, with a recent study from the Institute of Education demonstrating that reading for pleasure is more important to a child’s social mobility than their parents’ education, and that those who read more perform better academically at maths as well as spelling and vocabulary. “Reading simply for enjoyment is so important to a child’s development and a wonderful activity to share with others. We need everyone in Liverpool to act as role models for our children, reading at home, reading in schools and reading in the community. 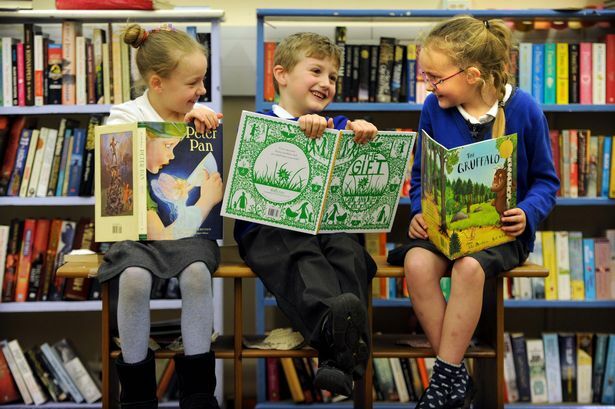 City of Readers is asking individuals and organisations to ‘Give Us Five’ towards the project, whether joining the Echo’s campaign pledging to read an extra five minutes a day, donating £5 towards an event, or volunteering for five hours a week. The Give Us Five campaign is central to the first year of activity and the first pledge was given by our patron and local writer Frank Cottrell Boyce. He has offered 5000 words through the writing of a brand new book for the project which will appear in installments on the City of Readers website from June. Members of the public will be invited to send in sound recordings which reflect Liverpool to inspire each installment, before the book is finally unveiled at The Reader Organisation’s Penny Readings in December. Liverpool Echo is calling for people to spend a minimum of five more minutes a day reading – adding up to a grand total of five million more minutes across the city in a single year. You can sign up to the Echo pledge here. If you’d like to Give Us Five or find out more about the City of Readers project, visit www.cityofreaders.org.